The report also points out that China is pursuing a nuclear capability on its long-range bombers, saying the Chinese air force “has been re-assigned a nuclear mission.” “The deployment and integration of nuclear-capable bombers would, for the first time, provide China with a nuclear ‘triad’ of delivery systems dispersed across land, sea, and air,” the report said. The report states that in addition to the bombers it already operates, “China is developing a stealthy, long-range strategic bomber with a nuclear delivery capability that could be operational within the next 10 years.” My bet is it will be a LOT sooner than ten years. 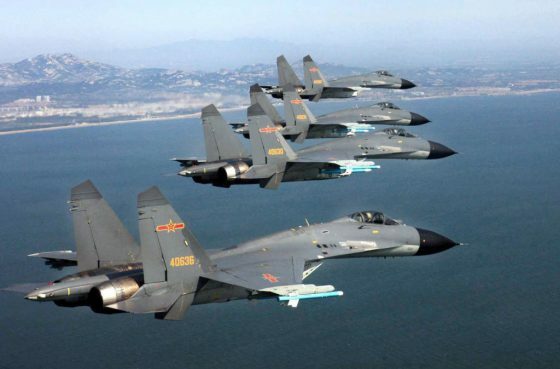 The Defense Department also warned of China’s efforts to expand its air strike range in the region. “The PLA may continue to extend its operations beyond the first island chain, demonstrating the capability to strike U.S. and allied forces and military bases in the western Pacific Ocean, including Guam,” according to the report. China has big plans where they want to be the largest world power out there and exert control over everything in and out of sight. That would include not only the South China Sea and Taiwan, but cyberspace, the Internet, and military prowess on land, the high seas, the skies and in space. They want it all. Basically, the communist Chinese have plans to rule the world and I don’t mean in a cutesy Pinky and the Brain way. Militarily, the report states that the People’s Liberation Army (PLA) has been developing capabilities in “overwater bomber operating areas” and is “gaining experience in critical maritime regions and likely training for strikes against U.S. and allied targets.” China is a clear and present danger to our national security. Part of China’s goals also includes strengthening the PLA so it can operate autonomously farther away from Mother China. Just last May, China also landed a long-range nuclear-capable bomber on an island in the disputed South China Sea. This raised alarm and tensions in the region. China had previously committed to not militarizing the area. They lied. Shocker there. It’s okay to lie to barbarians and that is what they consider anyone who is not Chinese. Things have been at the boiling point between China and the U.S. for months now over an escalating trade war and tariffs. President Trump has also announced a Space Force in part to counter threats from the Chinese and Russians in space. Those countries already have weapons up there capable of taking out our satellites and launching an attack on the U.S. For those that make fun of a U.S. Space Force, you might want to consider that we are late to the game here and in real peril due to the threats from space from our enemies here on our own planet. The new report said that China’s space program “continues to mature rapidly” and is also developing counter-space capabilities to “degrade and deny adversary use of space-based assets during a crisis or conflict.” The Russians are doing the same thing. The report also found that China’s relationship with North Korea has reached “the lowest level in decades” as it works on a dual-track approach that uses both dialogue and pressure on the rogue regime over its nuclear capabilities. I disagree with that part of the report. The Chinese control the North Koreans. That’s why Kim Jong-Un runs to Xi for approval. China and North Korea are playing cat and mouse with the U.S. and the world over nuclear weapons. The NoKos have no intention of denuclearizing unless you count launching them as some form of that. They are a proxy for the Chinese. “A man cannot prosper without honesty, the same is true for a country,” Wu said. “We urge the US to stick to its promises to China regarding Taiwan question, and uphold the one-China policy.” That means back off Taiwan and cede the territory to us. We own them. It is rich that China speaks of honesty here when they have no qualms whatsoever in deceiving the U.S. and our leaders. Not to mention their spies they have planted throughout American society and their wholesale theft of our technology. The US report didn’t just highlight threats to the United States or its allies — there was also a broader discussion of the spread of Chinese influence around the world. China formally established its Djibouti military base in July last year, followed several months later by the country’s controversial acquisition of the Hambantota port in Sri Lanka. Around the time of the Djbouti base opening, an editorial in the state-run Global Times stressed its importance to Beijing’s plans. “Certainly this is the People’s Liberation Army’s first overseas base and we will base troops there. It’s not a commercial resupply point… This base can support Chinese Navy to go farther, so it means a lot,” said the paper. The Pentagon report said Chinese President Xi Jinping’s signature infrastructure policy, the Belt and Road Initiative (BRI), served to encourage countries to fall into line with China’s ambitions. “China intends to use the BRI to develop strong economic ties with other countries, shape their interests to align with China’s, and deter confrontation or criticism of China’s approach to sensitive issues,” the report said. China plans longterm. I’m not talking a year out or five or even ten. They plan not only decades out, but centuries. Every move that China has made over the last ten years and longer screams that they plan on a worldwide confrontation at some point that they intend to win. Think of it as the biggest game of RISK ever played and right now, the U.S. isn’t even on the board much less really playing the game. The Pentagon and our military leaders have known this for a long time now. If they are finally coming out and saying this my bet is they are truly worried and are preparing our military as fast as possible for a possible confrontation not only with the Chinese but Russia and Iran. It’s not a Cold War mentality, it’s a war-footing mentality. This entry was posted in Authors, Military, Politics, Terresa Monroe-Hamilton. Bookmark the permalink. One country that needs to take note of this (though they are to an extent) is Japan. Though they have revised Article 9 of their constitution, the Japanese need to rearm even more, and fast. They should also go nuclear, like Israel.